It is with heavy hearts that the family of Eleonora Prokipchuk announce her passing. 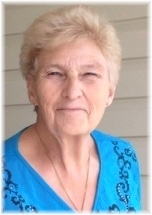 Eleonora Lucy-Ann Angelo Francis Prokipchuk 79 years of Dauphin, MB went to be an angel on Saturday, January 26, 2019. She passed away in the Health Science Centre in Winnipeg, MB after a short battle of cancer. Eleonora was born August 29, 1939 at St. Bonfice Hospital in Winnipeg, MB and she had two brothers Al and Lenard. She grew up in Winnipeg. She married Walter Prokipchuk in 1963 and together they had three wonderful children, Tim, Teresa & Todd. She lived there till she and her children moved to Dauphin in the early 80's. She resided there till her time of passing. Eleonora enjoyed helping our her community, she volunteered for many years with the food for thought program, Ukrainian dancing, Countryfest, Ukrainian Festival, Dauphin Kings hockey games. She enjoyed getting out and lending a hand. Eleonora was a witty lady, she liked to joke around and if she didn't like what you said, she would have let you know, or how she rolled her eyes when you said something wrong or inappropriate. She was also known for her cooking abilities, which her grandkids can attest to. Her grandson Dylan loved the perogies they made, granddaughter Carissa loved the Mexican lasagna, grandson Michael loved her little perogie cheese bits, which anyone whom has tried can agree, grandson Deston loved her pecan butter tarts, and the baked goodies were so yummy too. Eleonora was predeceased by her parents; brothers Dr. Al Molaro fo BC, Lenard Molaro of AB. She is survived by her son Tim Prokipchuk (Ina) of Winnipeg, MB, Teresa Prokipchuk of Sifton, MB, Todd Prokipchuk of Dauphin, MB; grandchildren Dylan, Carissa & Deston Yaciuk of Sifton, MB, Michael Prokipchuk of Winnipeg, and many dear friends that she made over the years. A special thank-you to the staff at the DauphinGeneral Hospital for all their care, and at the Health Science Centre in Winnipeg GH 7 Ward, you people are appreciated for all you did with our Mom. Memorial Service was held on Sunday, February 3, 2019 at 2:00 pm from Sneath-Strilchuk Family Care Centre in Dauphin, MB with Pastor Scott Allen officiating. Should friends so desire, donations in memory of Eleanora may be made to the Canadian Cancer Society.